Every winter in Chicago I find a new favorite food that gets me through my vitamin D withdrawal. Last year it was XOCO , Rick Bayless’s take on upscale Mexican street food. This year, it’s all about Asian food. Dustin and I have been to Slurping Turtle, a local trendy Japanese noodle shop, at least five times in the last month. That’s a lot for us since I usually cook at home. The first time we went, it was still very new and only a few people had heard of it. Now, my favorite noodle dish comes with a 45 minute wait. It only made sense for me to make my own noodles for my impatient days. The most important part of this dish, the part which also has the most ingredients, is the sauce. Your sauce has to be flavorful otherwise you’ll be eating a bowl of dry noodles and veggies (lame). 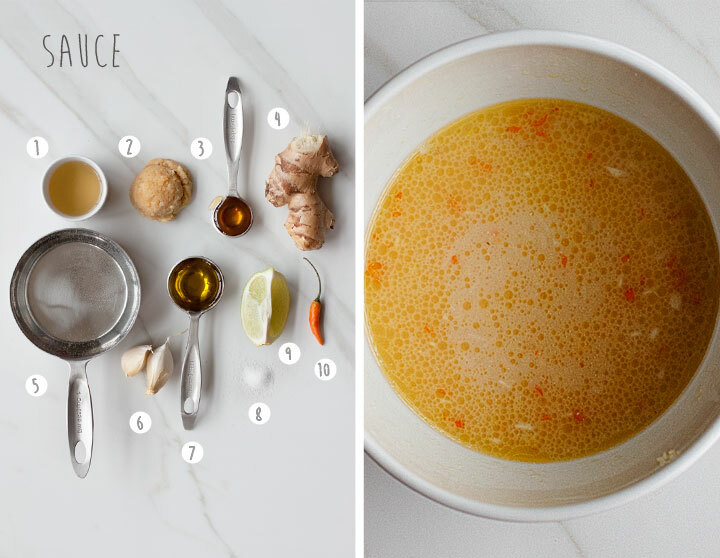 Once you gather all the ingredients, it’s easy to make. INSTRUCTIONS: Mix all the ingredients together in a bowl and let it sit at room temperature until the rest of your food is ready. I’ve had a tough time cooking with tofu in the past. It would break into egg-like pieces that would stick to the pan. Now that I have a cast iron skillet and use firm tofu, the chunks keep their shape and brown perfectly. My veggies are mixed and matched and based on what I have available in my fridge. I do recommend using a green veggie, such as Brussels sprouts or bok choy, for a nice crunchy texture. These are my personal favorites. 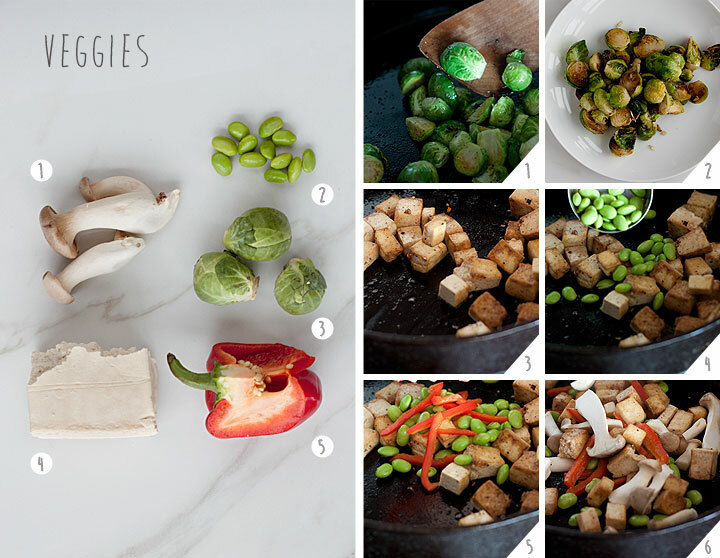 INSTRUCTIONS: 1) Heat olive oil in a pan and brown Brussels sprouts 2) Remove the Brussels sprouts once they are slightly crispy 3) Cube the tofu and brown it in the same pan 4) Add edamame 5) Add thinly-cut red peppers 6) Add mushrooms and remove everything once browned. 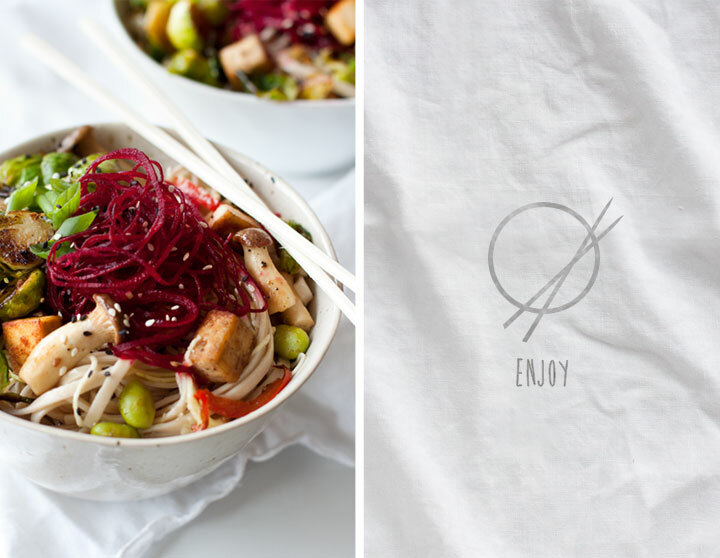 I used regular soba noodles, but added shredded zucchini and beets to my final dish to make it a little healthier. In the summertime, I could easily just eat this dish with veggie noodles, but I like my carbs in the winter. The beets are also a bright and beautiful visual touch. Once everything was prepared, I started assembling: soba noodles first, followed by the zucchini and beet noodles, then veggies, my desired amount of sauce drizzled on top, and my optional toppings. This dish is full of flavor and beautiful textures. I hope you enjoy it as much as we did. 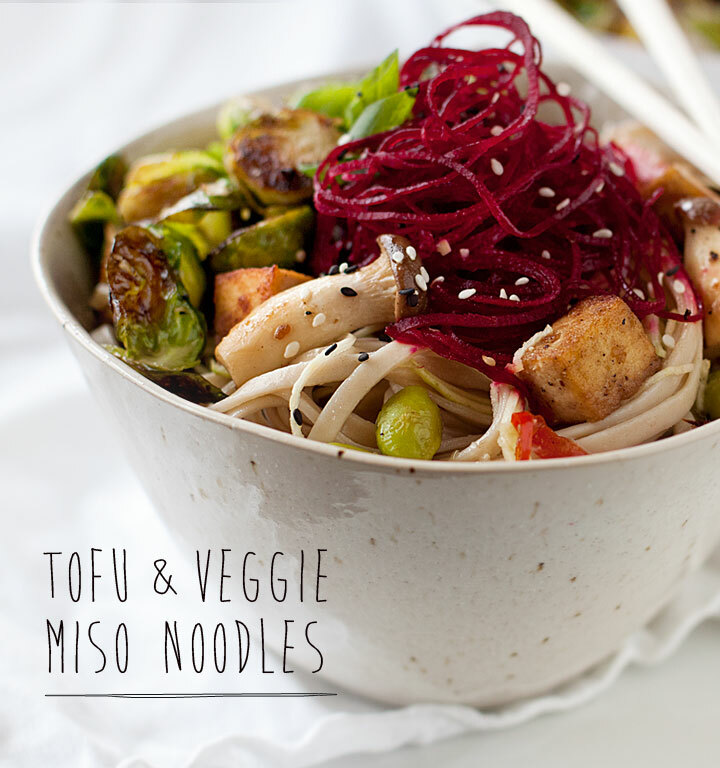 § 10 Responses to Tofu and Veggie Miso Noodles"
mmmm I want to try this! What is a spiral cutter? Hello. I love using my spiral slicer (link). It’s a great way to eat less carbs and get a surprisingly similar texture from pasta. Wow, that is a bowlful of color and I’m sure, flavor too. Some ingredients I’ve heard of, others I haven’t. Always learn something new from you. Keep your creative food postings coming. I love the colorful and helpful step by step instructions. Excited to see what’s next. You are always so nice. I hope that people can take bits and pieces from this recipe. 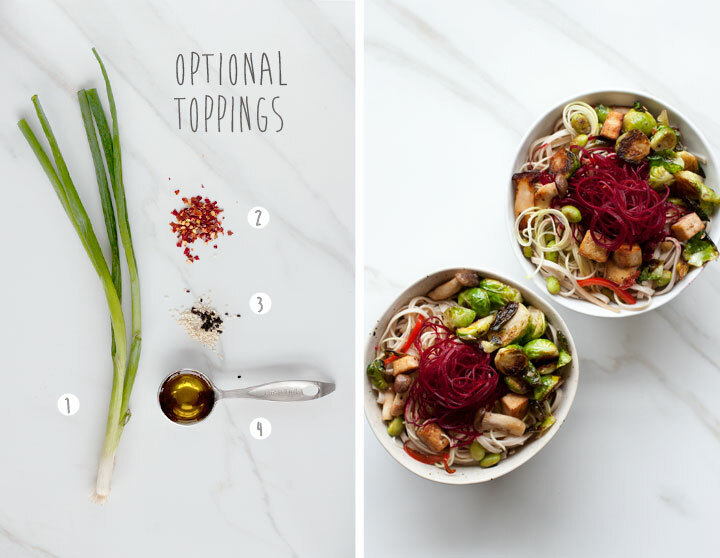 For instance, maybe replacing regular noodles with raw zucchini or beet noodles or using tofu instead of chicken. I’m so glad to have discovered your blog today. It’s beautiful! I really can’t get enough miso lately (I swear it’s magic). This dish looks marvelous. Thank you. Your blog is lovely as well and your assistant is adorable. I’ve been really into miso lately too. Must be something in the weather. i think i just fell in love w your site. That is the most awesome compliment! Thank you so much. so beautiful as always – the beets really set this dish off! i wish i could grab the chopsticks right from my computer screen and dive in…if only…. 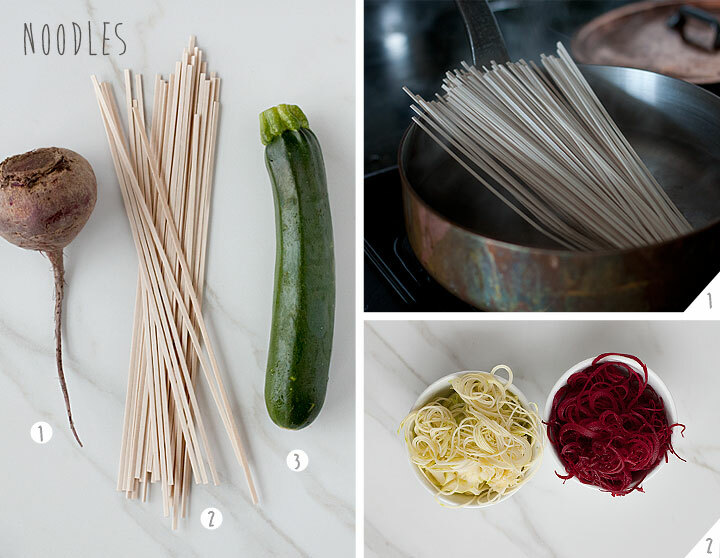 I was originally worried about the beets being overpowering, but I could have used the raw beets and zucchini without the starch noodles. Thanks for the compliment.